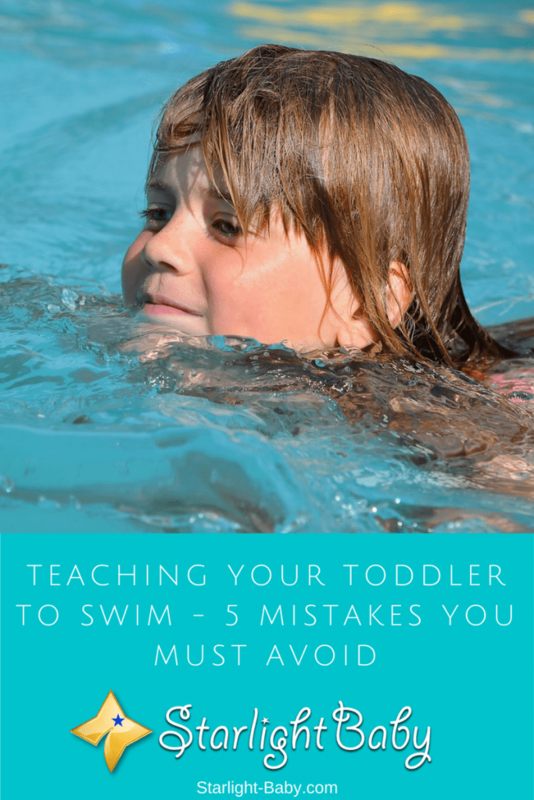 If you want to ensure your toddler stays safe and happy throughout the lessons, below you’ll discover 5 mistakes to avoid when teaching your toddler to swim. No matter how warm it is or how excited you both are, it’s important to establish a “getting into the pool routine”. That is, things you both need to do before you actually get into the water. It could be changing into a swimsuit and changing your little one into a swimming diaper. Then, applying sunscreen and maybe sitting on the pool edge for a minute or two before sliding in. The reason this is important is because it teaches your toddler they should never just jump into the water at any time they feel like it. It also helps to have a verbal cue which tells them when it is okay to get in. They’ll learn that there are certain things which need to be done and said before they can get into the pool. This reduces the likelihood they will jump in without you – a vital safety tip that works well when you’re not always around or you have your back turned. Floats and water wings are there for kids to use, but they can actually give your toddler a false sense of security. That’s because they can easily slip out of your child’s grasp. If they let go or if it slips, they won’t have anything to stop them going underwater. Not only does this pose an obvious risk of drowning, but it can also cause them to develop a fear of the water if they do go under unexpectedly when they felt protected. A good alternative is to start teaching your toddler how find and swim to a ladder or step to get out if they need to. Teaching them how to climb their little hands over one another on the pool’s walls is a great way to do this. From the minute your little one is born, your instinct is to protect them and keep them happy and healthy. The last thing you want is to see your baby cry. So, the thought of startling them by making them go underwater for the first time can be off-putting. However, while yes it might be upsetting, it’s also an essential skill they need to learn. If you don’t teach them to go underwater, if an accident happens or they end up underwater for any reason, they aren’t going to know what to do. The earlier you teach them to go underwater, the easier it will be. Obviously you should never just dunk them under without warning – be sure to follow the safety exercises exactly as they are given. It may sound pretty obvious, but you should never be more than touching distance away from your little one while they’re in the water. Even if you decide to give swimming floats a chance, as mentioned earlier they can easily slip out of grasp. If you’re not there to catch your toddler, it doesn’t just increase their risk of drowning, but it also increases the risk they’ll develop a huge fear of the water. This also means you should learn to swim yourself if you don’t know how to already. As a parent, it’s natural to worry and panic when things go wrong. If your toddler does end up unexpectedly going under the water, as difficult as it might be, try not to let your panic show. If you pull them up in a state of panic, it’s not only going to make them become even more distressed, but again they’ll likely develop a fear of the water. You’ll then struggle to convince them to go with you to the pool again. Enroll your toddler into professional swimming lessons. Never leave them unsupervised, even in really shallow water. If you have a pool at home, be sure to create a barrier for when it’s not in use. Don’t force them into the water, if they don’t want to swim, try again later in the week. Start building up water confidence at bath times. Choose a time to go swimming when it isn’t going to be too busy. These are just some tips that can help make teaching your little one to swim a little easier. Overall, swimming with your toddler can be fun and it can also really help you to bond together. You just need to make sure you follow strict water safety rules and know exactly what to avoid to keep them safe. It should not be difficult for the little one to get into a pool as it already gets that practice while inside the womb. Having said that the situation being different precautions are really called for. That routine including some discipline such as wearing a swimsuit and not just plunging in is indeed a good idea. Back home girls never learnt to swim and boys did it jumping into lakes with a coconut tied round and that too not until he reached his teens. 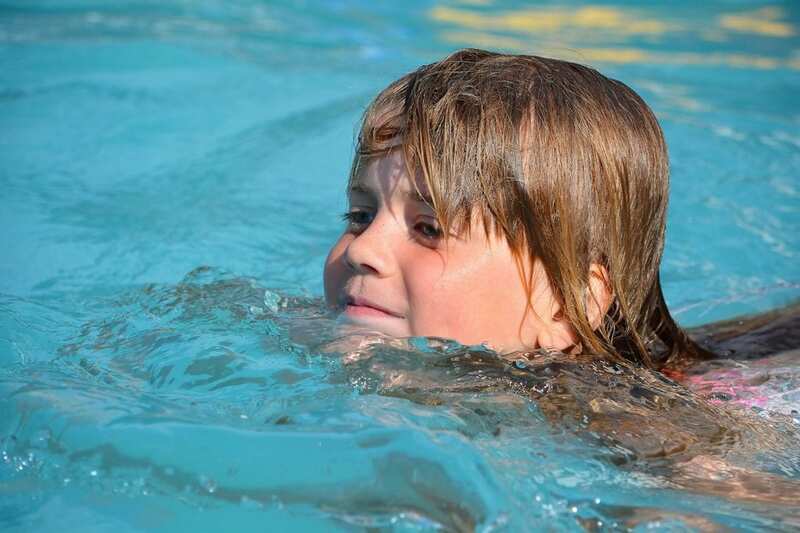 Swimming is a fantastic experience and actually a skill that kids need to learn “just in case”. Initially, they may hesitate but you have to show your toddler how wonderful it is. Gradually introduce him/her to the pool before letting him/her take a plunge. I’m sure your child will eventually love it and may not want to leave the pool. As always, your child’s safety should be your utmost concern. Watch your child like a hawk. It is very difficult to make a child swim. I have tried to teach my 10 years old son but I couldn’t because he is too scared and fear water very much. I cannot afford to pay an instructor here because here it costs over 200 dollars a month to take swimming lessons! Sorry to hear that about your son. But I would say it’s not too late. I’m sure he will eventually conquer his fear of the water if you’re able to slowly introduce him to it — probably a walk by the beach if you’re near a sea/ocean. Just take walks until he begins to appreciate the water. Next time, you could probably ask some of his friends to come with you. If he sees his friends enjoying swimming, he will likely become curious and go near the water. Do that several times until he finds the strength to finally swim. My parents never taught me how to swim and up till this moment, I’m afraid of going near a pool. It is nice to see tips on how parents can teach their kids on how to swim and I just wished I was taught while a kid. I’m sorry to hear about your situation, Henrywrites. I guess you’re afraid because you do not have the skill and wouldn’t know what to do. You simply didn’t have the dare spirit in you to go out of your way to learn how to swim. The truth is that most African parents don’t have enough time at their disposal to teach their kids how to swim as they are too busy chasing money and business. You could have easily gone with your friends that knew how to swim and learn from them but be rest assured to drink the pool water a few times before you master how to swim averagely. Swimming is a life saving at the same time it’s a life threatening. I would suggest that swimming should be learn formally by an professional swimming instructor in right place and right swimming pools accordingly with first aid providers available. Teaching the proper techniques in swimming are important depending how the toodler cope up with the water as well. Swimming could be traumatic for starters if not properly teached and learn so better have a formal training for them. It’s a good form of exercise, breathing and lungs development. Swimming is fun, makes us fit and life saving. Swimming involving toddlers should be handled by professionals if you have the financial capability to pay for an instructor. It’s not wise to do it on your own. But the pre-swimming lessons can be handled by the parents, like taking the toddlers to pools or beaches to introduce them to the water so they don’t fear it. And yes, swimming is a life-saving skill and a good form of exercise so it is important to learn it. If you haven’t seen anyone drown before, you you would be careless when teaching your kid to swim. But if you have witnessed someone drown just once, safety would be the first thing you look out for when teaching your kid how to swim. Thanks for the informative article, it’s very helpful in getting parents know how to go about teaching their kids how to swim. Soon summer will be here. When summer arrives, my baby boy will be one year old. My baby boy loves playing in the water, therefore, I will be buying him a bathing tub, however, it is too early to teach him swimming. However, I appreciate the tips mentioned in the article. These tips will surely help the parents who have toddlers.